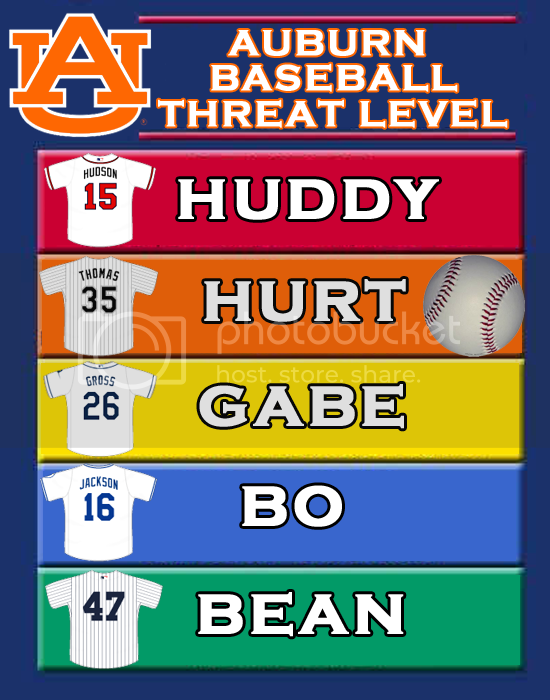 From the original threat level: Threat Level Hurt Named for Frank Thomas, aka "The Big Hurt". Team has power and decent pitching. Super Regional bound. A few players playing a All American level. Most playing at All-SEC level. Auburn doesn’t lose a ton from last year. A full year in the CJP system? Talented JUCO guys who can compete right away? A do-or-die attitude? All there. All ready. Hopefully, we don’t slip past Threat Level Gabe. If we do? We are in trouble.